Bring Me The Horizon have announced a slew of US tour dates with Chiodos that will take place throughout the month of September. You may be thinking to yourself, “Didn’t you report that Bring Me The Horizon and Chiodos would be going on tour with A Day To Remember over a month ago?” You’re right. We did. This tour, which was announced earlier this week, will take place on the off dates of ADTR’s fall headlining run. Whenever there is a gap in that tour, these shows will take place, and if you live in New York, Michigan, Missouri, or Nevada that means you now have one more chance to see BMTH and Chiodos share a stage this year. You can view all the dates via a promotional poster found at the end of this post. 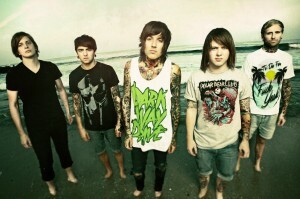 Speaking of Bring Me The Horizon, frontman Oli Sykes has a clothing company known as Drop Dead that many of you may enjoy. It’s a little pricey, especially if you live here in the states (damn you, currency exchange rates! ), but they recently released a Simpsons inspired series you need to see to believe. Click here to check it out.